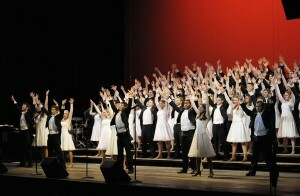 The Indiana University Jacob School of Music Singing Hoosiers, presented by the Wabash Valley Music Association, will perform at 7:30 p.m. Saturday, Feb. 16, at the Honeywell Center in Wabash. Founded in 1950, the Singing Hoosiers was a men’s concert choir with 50 members. The group was one of only three choral ensembles in the fledgling I.U. Jacobs School of Music. Soon, female voices were added and today the ensemble averages 85 student singers and instrumentalists from the Jacobs School of Music as well as students from throughout the university. Since its start more than 60 years ago, the Singing Hoosiers have entertained millions in 18 states and more than 26 countries, including Europe, Australia and Asia. Their performances are always energetic and include choreographed numbers featuring American popular music, jazz and Broadway favorites. The ensemble tours regularly under the direction of Conductor Steve Zegree, and has performed throughout the world with major symphony orchestras, and has made recordings on major labels. Tickets are $15, $25, and $35, and can be purchased at the box office from 8 a.m. to 5 p.m. Monday through Friday, by calling (260) 563-1102 or online.